Raymond Loewy's portfolio includes many corporate logos. Chief among these are the logos for Exxon Mobil and Shell Oil. Exxon is an Americanized version of Esso which was derived from a phonetic form of the initials for Standard Oil (SO = Esso). Loewy was hired by Standard in 1966 to find a new name and design a new logo for its Esso brand. 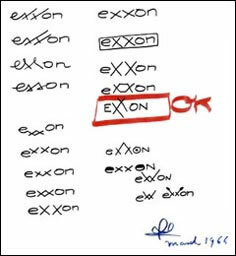 Loewy proposed 'Exxon' and came up with dozens of rough pencil sketches based on the word. 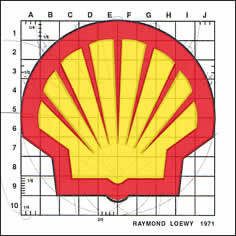 In 1967 Shell Oil Company approached Loewy to update its existing logo. Loewy's Industrial Design firm spent more than four years redesigning the familiar scallop shell. The new design became official in 1971 and is still in worldwide use today. 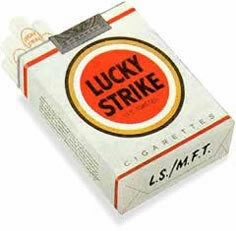 The classic Lucky Strike cigarette soft pack dates from the 1940s and remains practically unchanged after half a century. Loewy’s transformation of the 1940 lucky strike pack included: replacing the green background with white, turning the circular motif into a stronger target device, making both sides of the pack identical by featuring the target on both sides, and sharpening up the typography. Samples of other, less well-known logo designs. The familiar EXXON logo by Avanti designer Raymond Loewy. Classic 1940s Lucky Strike package. The Hoover logo by Raymond Loewy. The world famous Shell logo.